Posted on 24 June, 2016 at 3:32 pm. This March we launched the findings of a major new piece of research conducted in association with the University of York. We wanted to explore the social, economic and health impacts that our work has had on our beneficiaries. 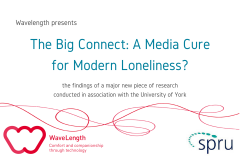 Researchers from York interviewed people across the country to find out how media technology had changed their lives. The interviewees were disabled, homeless and vulnerable people who had previously suffered from loneliness and social isolation. They had all received radios, TVs or tablet computers from WaveLength to help them overcome their loneliness. The research was led by Dr Annie Irvine and Professor Martin Webber. Granting access to information and inspiration, from advice on emotional wellbeing and mental health to details of social opportunities or job vacancies. Participants also reported that technology lifted low moods and increased their motivation. To read a summary of our findings, click here. I am a volunteer with Silverline connects team, I am trying to help a lady living in the Roath area who is wheelchair-bound and very isolated. She has a mobile phone, but she cannot use it because she does not know what to do. Do you know if anyone in the Roath area would come out to give lessons to her. Hi Jean, thanks for your message. We asked Independent Age to see if they knew of any service like this. They thought that The Royal Voluntary Service would be able to help (0845 608 0122), but if they can’t Independent Age said that you should feel free to call them on 0800 319 6789 and they will try to suggest an alternative. We hope this is helpful – wishing you every success!